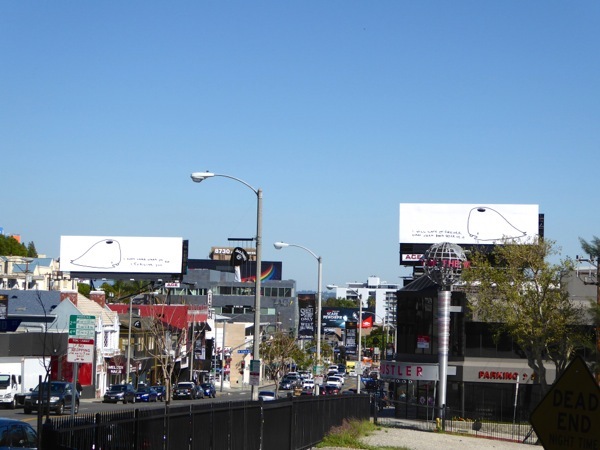 There's always so much to see around L.A., from the plethora of eye-catching billboards in the skies to the graffiti wall murals at street level. 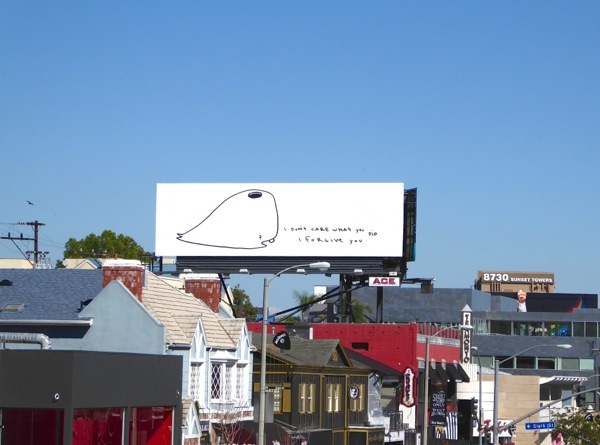 This duo of cute 'Munko the Whale' billboards combines the two disciplines along the busy Sunset Strip in West Hollywood. 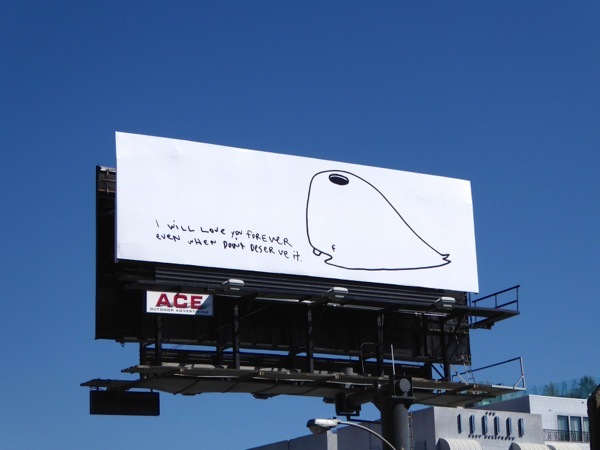 Created by Los Angeles born street artist David Choe, who famously painted Facebook's first office and took stock in the social media company over cash, the whale-themed billboards were snapped on opposite sides of the Sunset Strip (above the Whisky A Go-Go club and Hustler Hollywood store respectively) on March 8, 2016. 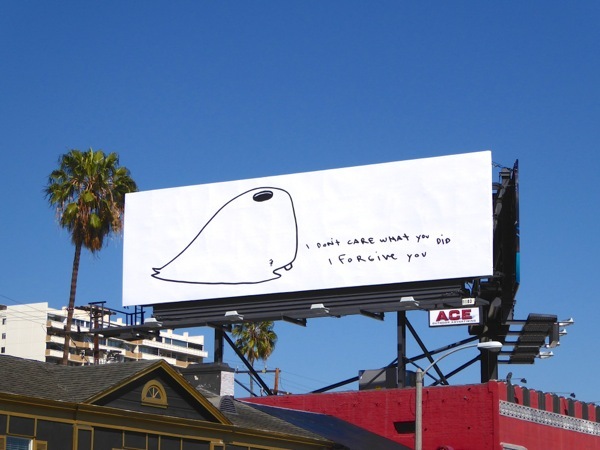 The whimsical outdoor ads don't seem to be selling anything, aside from raising the profile of the Munko, but their personal copy which reads 'I don't care what you did I forgive you' and 'I will love you forever even when don't deserve it' is a breath of fresh air from the usual sales oriented ads trying to get you to buy, do, or watch something. 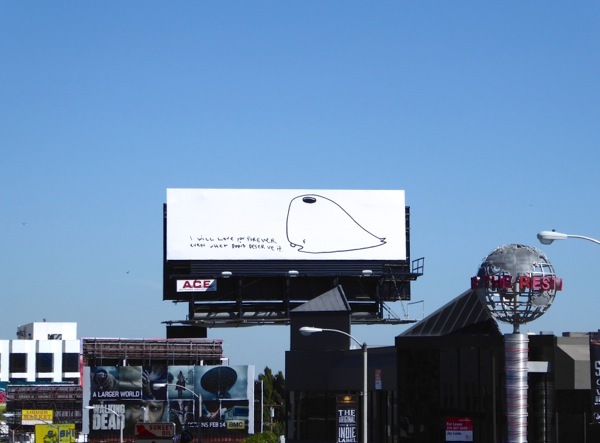 If you like this duo of lovable whales, be sure to also check out these other examples of advertisers that had used this unique billboard location in the past, like these interconnecting billboards for The Bridge TV series, these Google Play billboards and even these dueling cannons for the launch of Starz Black Sails series. The real question is, will we ever know who Munko loves and forgives, or is that a mystery for another day?